Introduced in 2008, USB 3.0 was considered as a quantum leap in the transfer speed of data on storage media. Introducing the concept of “superspeed” (High Speed). USB aka Universal Serial Bus, a standard for data transmission serial bus used to interface devices to a computer. For optimum performance, a computer with USB 3.0 port is necessary although USB 3.0 flash drive will work on a 2.0 USB port, but it will work at the speed of a 2.0 USB key. What is USB 2.0 or 3.0? These are simply all versions of the USB standard: they define the type of USB connector that corresponds to them. The biggest characteristic is the rate of transfer. Information to remember: the higher USB version is backward compatible, ie a USB 3.0 port for USB memory will work with 2.0 and 3.0; a 2.0 USB flash drive will work on a USB 3.0 port but it will run at the speed of a 2.0 speed. 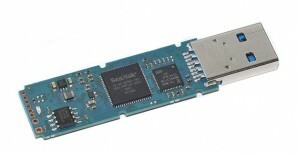 One way to recognize a USB device 3.0 is the size of it. 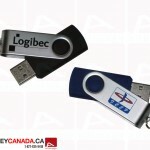 As shown in the images, USB 3.0 keys are larger than the USB 2.0 key. The circuit of the USB 3.0 key is larger, that is why USB key housing needs to be larger to accommodate the larger memory. 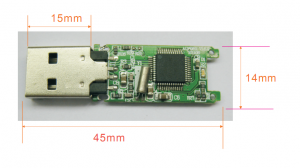 Mini USB keys cannot be produced for USB 3.0 at this time.